Katamreddy Siva Prasad is a Senior Software Engineer working in E-Commerce domain. His areas of interest include Object Oriented Design, SOLID Design principles, RESTful WebServices and OpenSource softwares including Spring, MyBatis and Jenkins. RabbitMQ is one of the popular message broker solutions and provides client libraries to be used from various programming languages including Java, Scala, .NET, Go, Python, Ruby, PHP etc. In this tutorial, we will learn how to use RabbitMQ message broker to send and receive messages from a SpringBoot application. We will also look at how to send messages as JSON payloads and how to deal with errors using Dead Letter Queues (DLQ). First, install RabbitMQ server on your local machine as documented here https://www.rabbitmq.com/download.html or run as a Docker image with the following docker-compose.yml. Now you can start the RabbitMQ using docker-compose up and launch Administration UI at http://localhost:15672/. If you are familiar with other Messaging brokers like ActiveMQ, we usually use Queues and Topics to send one-to-one and pub-sub model of communication. 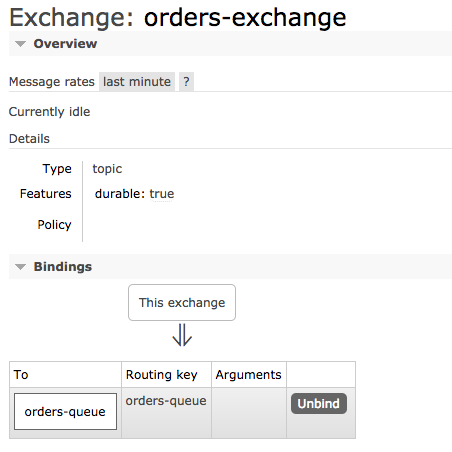 In RabbitMQ we send messages to Exchange and depending on Routing Key that message will be forwarded to Queue(s). You can read more about RabbitMQ concepts here https://www.rabbitmq.com/tutorials/amqp-concepts.html. Now, let us create a SpringBoot application from http://start.spring.io/ selecting Web, Thymeleaf, and RabbitMQ starters. Here we are declaring a Queue with name orders-queue and an Exchange with name orders-exchange. We also defined the binding between orders-queue and orders-exchange so that any message sent to orders-exchange with routing-key as “orders-queue” will be sent to orders-queue. Let us create a Spring bean OrderMessageSender to send a message to orders-exchange. Spring Boot auto-configures the infrastructure beans required to send/receive messages to/from RabbitMQ broker. We can simply autowire RabbitTemplate and send a message by invoking rabbitTemplate.convertAndSend(“routingKey”, Object) method. By default Spring Boot uses org.springframework.amqp.support.converter.SimpleMessageConverterand seriailize the object into byte. Now with this configuration in place, we can send a message to RabbitMQ orders-queue by invoking OrderMessageSender.sendOrder(Order) method. Now go to Queues tab and click on orders-queue. Scroll down to Get Messages section and by clicking on Get Message(s) button you can view the contents of the message. Now, let create a Listener to the orders-queue using @RabbitListener. That’s it!! By simply adding @RabbitListener and defining which queue to listen to we can create a Listener. Now if you send a message to orders-queue that should be consumed by OrderMessageListener.processOrder() method and you should see the log statement “Order Received: “. As we have seen the default serialization mechanism converts the message object into byte using SimpleMessageConverter and on the receiving end, it will deserialize byte into the Object type (in our case Order) using GenericMessageConverter. In order to change this behavior, we need to customize the Spring Boot RabbitMQ auto-configured beans. One quick way to send a message as JSON payload is using ObjectMapper we can convert the Orderobject into JSON and send it. But converting objects into JSON like this is a kind of boilerplate. Instead, we can follow the below approach. We can configure org.springframework.amqp.support.converter.Jackson2JsonMessageConverter bean to be used by RabbitTemplate so that the message will be serialized as JSON instead of byte. Now when you send a message it will be converted into JSON and send it to Queue. In order to treat the message payload as JSON we should customize the RabbitMQ configuration by implementing RabbitListenerConfigurer. We may want to send invalid messages to a separate queue so that we can inspect and reprocess them later. We can use DLQ concept to automatically do it instead of we manually write the code to handle such scenarios. Now try to send an invalid JSON message to orders-queue, it will be sent to dead-orders-queue.